With a theme slightly similar to Fortunately, the dire nature of this story is a hit with my son in that anytime he thinks something bad is going to happen and then it doesn't.... well, he goes mad with laughter. Go figure. Boy was just sitting on a rock in the jungle when along came Tiger. "Run," said Tiger. "And I will run after you. And I will catch you. And I will eat you, Boy. So run from me." Boy just sat there and looked at Tiger. "Eat me then," said Boy. "I have no more run in me." 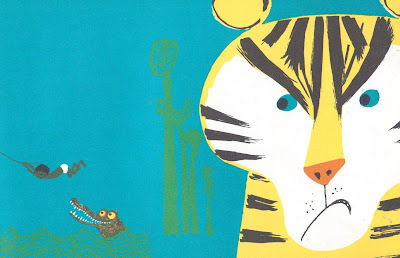 Boy goes on to tell Tiger a tale of horror and woe and uplift involving a rhino, a crocodile and a surprise ending that always gets my son screaming, no matter how many times he's heard it. Simple pictures. Simple story. Spot on. Aliki fans will dig it as here she is at her most primary. 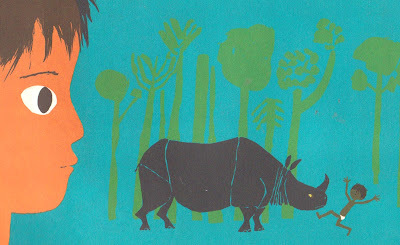 I didn't scan the back of the book, but let's just say the drawing of the grumpy rhino with his black/blue skin, white line frown and yellow eyes is about one of the coolest animal illustrations ever. Fun little 49 cent find for sure. 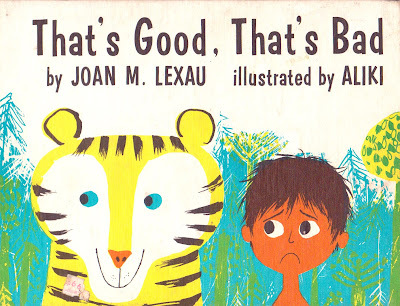 Loved this book as a child, had to read it to my kids when they were little. Tells all about life, that it can be viewed as good or bad, it's what you make of it. My absolute favorite book growing up. I read it to my kids now, and they love it too. Love this book still to this day. I just ran across your blog - thanks! Do you know Our Animal Friends On Maple Hill Farm? It is a great look at animal personalities.